Do you know how to spot fake followers before working with an influencer? An individual with fake followers can sink your influencer marketing efforts. It’s important to research a person’s follow/unfollow patterns and review social platform insights before working with a new influencer. How easy is it to create a completely artificial influencer presence these days, fake followers and all? According to digital marketing firm Mediakix, it can be accomplished on Instagram with about a $300 investment, in a matter of weeks. Digiday was one of several outlets to cover Mediakix’s experiment, where the company created a fake model profile and a fake travel influencer and were swiftly able to get brand sponsorship. Ideally, any smart brand marketer would have implemented Instagram’s new sponsored content tagging tool to supervise the spend and quickly pull the plug on the fake influencer whose reach did not match up to vanity metrics. But since the sponsorships were secured via third-party platforms, that’s not a given. The fact that these days, engagement groups (AKA “pods” or “tribes”) organized on Telegram enable between 20-2,000 members to create the appearance of organic engagement while actually only interacting with each other. If you’ve spent money on an influencer campaign — especially if you’ve used a social agency, a PR agency or an influencer agency — you’ve probably fallen prey to one artificial influence game or another. But, but, but… My agency has expertise in this! We worked with a well-known influencer platform. I saw the Sprout Social reports! Okay, let’s work through these rebuttals backward. First of all, analytics sites do not identify fake influencer accounts, though Iconosquare and Fohr are developing tools to provide that deeper data in the future. Second of all, a number of influencer platforms and influencer management companies intentionally don’t provide the true reach of the influencers they rep. To do so would work against their own best interests, since influencer fees are typically based on follower numbers and front-end engagement numbers. And finally — it’s very nice that you trust your agency. However, agencies are practiced in building projects around client requests — not redirecting the client to a less expensive path. If you only ask for “an influencer with a millllllion followers!” and you don’t put parameters around that, the agency will not imperil their project fee by pointing out that you should go through extra verification steps. 1. Review the pattern of follows and unfollows. 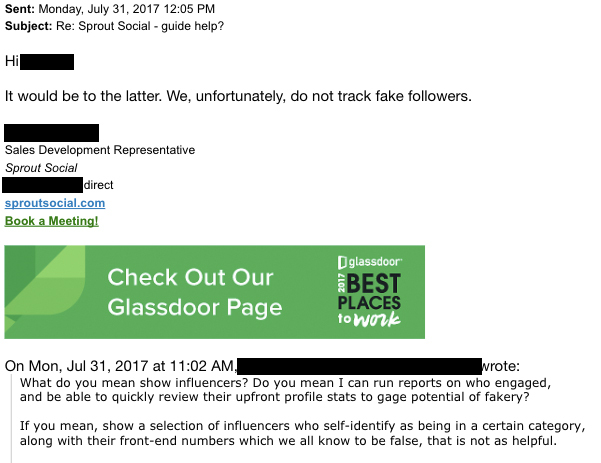 Ask your social coordinator to pull Social Blade reports on all prospective influencer partners’ Instagram “Follow” and “Unfollow” graphs. These are available by searching under Instagram username, then clicking Detailed Stats button. Ignore the letter grade. Look first at 1-month Stat Summary. 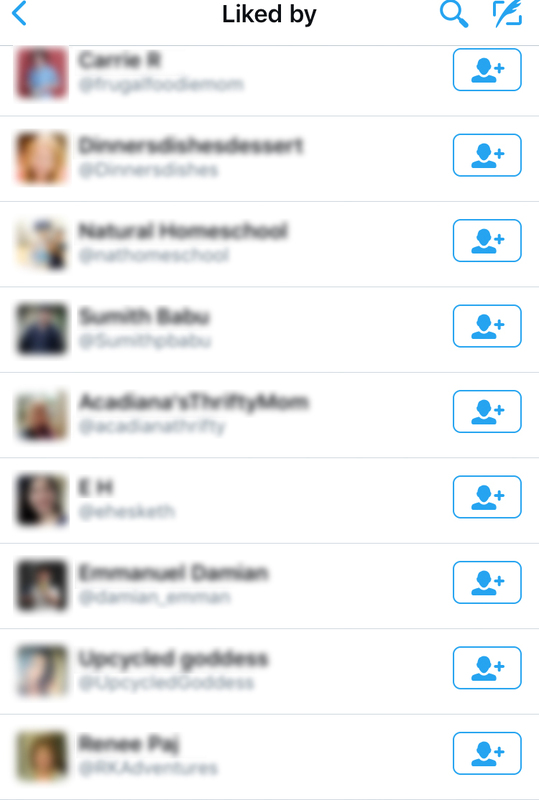 Bought followers are easy to spot. 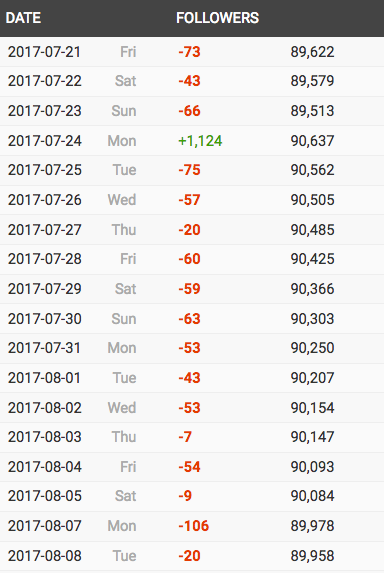 For example, this summary from a fashion influencer shows a net loss of followers every day except Monday 7/24, when there was a one-time gain of 1124. Then, scroll to the Total Followers graph to view results over a longer time window. Any sharp increases, as opposed to a gradual steady increase, denote a follower purchase. From December 2016 to January 2017, this person’s followers doubled from 30K to 60K. To spot influencers who are using the reviled “Follow-Unfollow” method, along with an auto-engagement program like Follow-Liker, you’ll look at the second set of results. In the 30-day Stat Summary, under the Following column, notice how this example is following dozens of people one day, then unfollowing dozens a day or two later. 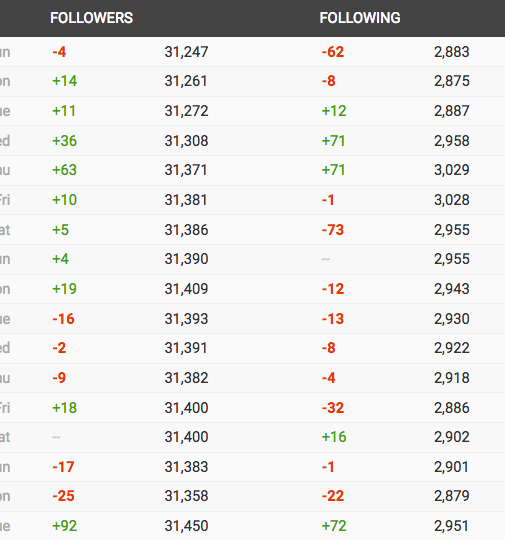 Of course, as you can see by the nearly proportionate number of unfollows, this method has an 80% dropoff rate. Unreported side effects including angry DMs from un-followed people (who will definitely never become customers), blocks and complaints that can lead to “less trusted” ranking with social algorithms. Not a healthy brand alignment. If a person has been doing this for a while, they were probably also using an auto-engagement app like Instagress to seek out targets via keywords. Thousands of freshly hatched influencers went from 0 to 100K followers between 2014 and early 2017 – before Instagram began shutting down auto-engagement tools. The more stubborn black hatters continue to seek out replacements, but many hobbyists are giving up. To check for people using this, look at the person’s Total Following multi-month graph. If it looks like an alarming EKG, they’ve been botting. 2. Investigate influencer’s Facebook Insights. Ask to see a screen capture of each influencer’s Facebook Insights. (Facebook has cracked down on influencers more sternly than any other social channel.) A good first analytic to check is Most Recent 5 Posts, which is a graph in Overview. This will show reach, clicks and engagements. Five posts should contain a mix of organic/editorial and sponsored posts. If sponsored posts appear to have significantly higher reach/engagement than unsponsored, that is a red flag that the influencer is boosting just those posts — using either paid Facebook promotion or organized engagement group promotion. If the Most Recent 5 Posts report on Facebook Insights raises a red flag, look closer, at the Reach analytic. This will show you whether the influencer is paying to boost their posts. This is legal, but it certainly isn’t the “organic exposure to an audience of devoted followers” that influencers promise. To check for promotional pods, manually evaluate the engagements related to #ad #sponsored posts. Are they all from other bloggers or influencers? Do the same names show up below multiple posts? If so, you’re most likely looking at an organized engagement group. Again, not a terrible sin— it’s just choreographed support of a campaign. But it is also evidence that an influencer isn’t achieving the organic reach/engagement that they’re reporting to clients. Engagement groups are massive on Instagram and on Twitter, where they can be fully automated so that people don’t even need to look at the content they’re Liking/ReTweeting. They are much less prevalent on Facebook. 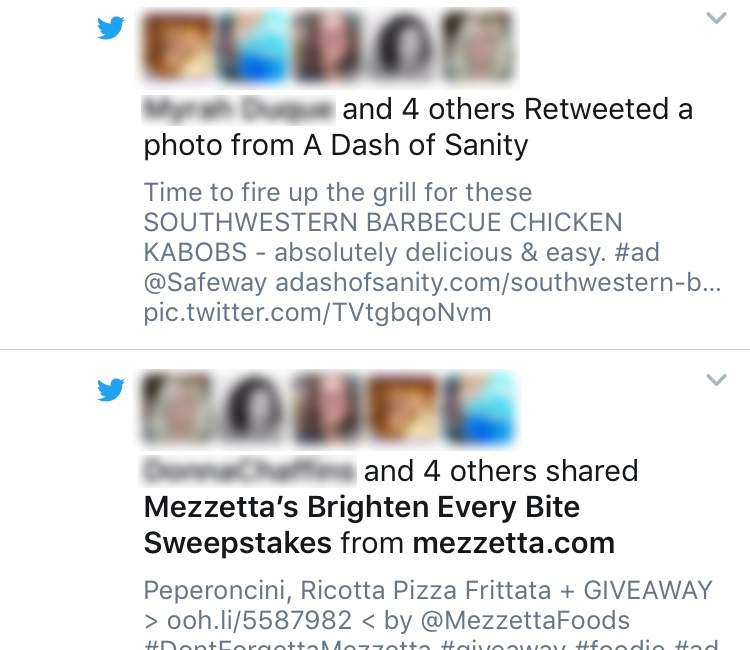 Here’s what group/pod engagement looks like on a Twitter Notifications feed (two Twitter campaigns in a row, with the exact same people engaging). Note: Users blurred for privacy. Click into the full results, and we find that all the accounts interacting with this Twitter “influencer’s” content were other bloggers/Twitter influencers. 3. Next, check Instagram Insights. Specifically, you ask for two things. First, in general Insights, request the Top Locations from which Followers are coming. If (for an influencer based in Dallas, let’s say) you see a Middle East city like Jeddah, a country like Bangladesh (where bot-farmers are known to flourish), or any Russian city, your prospective influencer has likely been buying from click-farms. Or, maybe they simply have a following mainly from the Middle East, or Russia. Would that be so terrible? No. Is that where your target audience is located? You decide. 4. Review a sample of posts, of your choosing. Impressions & Reach: How many times did the post get seen, by how many users? This is one metric on which you could base your fee structure. 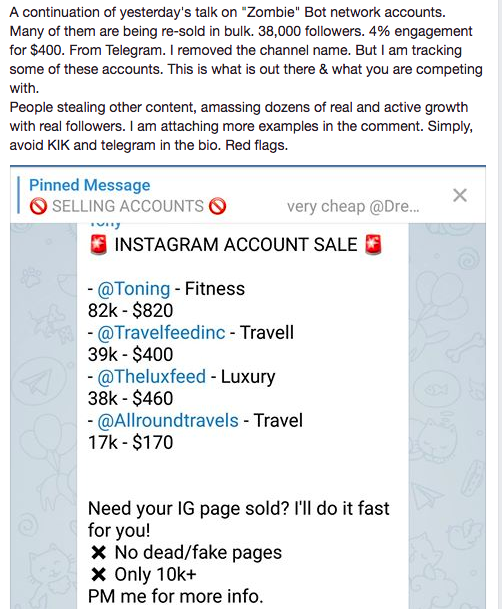 If one influencer has 20K followers and the other has 200K, but they are both getting 3,000 impressions on a post, you should pay them the same fee. Engagement: This metric is important as it shows you what percentage of an influencer’s audience is interacting with the content. It is also crucial for helping identify people who have purchased engagement from an app. In a normal Insight report, the post’s Engagement number will be in the 20-40th percentile of Impressions. However, when people buy likes/comments from an app like SuperComments, the fake engagements do not affect the authentic impressions/reach. Therefore you may see numbers that are nearly even or even topsy-turvy. That is artificial engagement, purchased from a click farm. To use an obvious example, see an Inc.com social experiment last year, a “potato influencer” account I created. This image reached only 94 people, but got 420 engagements (purchased). 5. Review engagement on multiple Instagram Stories. An additional step that many marketers are taking to weed out artificial influencers is to ask for multiple test Instagram Stories, and request a screencap showing Views after posts have been up for different times, or Instagram’s report on Stories engagements. Instagram Stories are the most visible and highly promoted feature on Instagram right now, and all legitimate influencers are focusing on their Stories to engage more of their audience. Forbes recently reported that 6-10% of people’s followers open an Instagram story — so, an influencer with 500,000 followers should get 30,000 to 50,000 views. Note: It’s possible to buy Instagram Stories views, but relatively expensive at $400 for 10,000 views, and most influencers are unwilling to spend that much money with no guarantee of a paid opportunity. When something raises your red flag, the quickest way to confirm fake accounts is a quick visual scan. Fake accounts will have very few posts, strange bios, be following many more accounts than follow them, and often be private. They don’t look like potential customers. And they show up in batches. Speaking candidly to the top brass among readers: Executives are often unwilling to entangle themselves in the micromanagement of campaign development and execution. Therefore, they are highly susceptible to artificial influence. Equating big numbers with high potential for ROI, many execs naturally are drawn to vanity metrics and averse to digging into nit-picky details. Might this describe you, even a bit? If so, realign your POV: You are the best person to save your brand from artificial influence, in the least amount of time. With the analytical skills that a leadership position requires, it’ll only take a few hours for you to familiarize yourself with red flag patterns among influencers, and then you’ll be able to spot potential numbers-padding at a glance. You’ll be able to oversee your marketing initiatives more intelligently, with data instead of buzzwords. With the new Instagram and Facebook sponsored posting tools, if you like like certain influencers’ content but are unsure about their true reach, you can actually link with them to see their reach, and adjust your budget based on their performance. One final note: Many influencers, or “reps” for influencers, will refuse to cooperate with a prospective client’s intelligence-gathering attempts. Don’t let them dictate terms. Any legitimate prospective partner will be happy to provide documentation— just as any high-quality job candidate would. They may even want to work out incentivized compensation based on the results they know they can deliver! As for the rest… Well, if an influencer marketing campaign only reaches this far, did it ever really run at all?